Algae moisturizer creams have been earning quite a reputation because of algae´s wonderful benefits for the skin. So, before looking at the reviews of some well rated algae moisturizer creams, let´s shortly look into algae skin benefits. What does Algae Do for your Skin? Algae are rich in minerals, vitamins and amino acids. Due to their low molecular weight, they can be fully absorbed by the skin. Apart from their emollient and moisturizing properties (they retain moisture in the skin), many types of algae have anti aging, lipolytic and antioxidant properties. Especially blue-green algae promote the regeneration of the epidermal cells and increase the natural production of collagen, elastin and hyaluronic acid. Overall, they help preserve youthful skin and they also work as natural sunscreen filters. Therefore, we understand how important algae´s function is to the skin. So, here I have chosen to review some good quality natural and organic moisturizers containing algae. 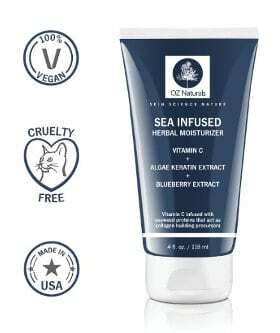 The OZ Naturals Sea Infused Moisturizer contains some great antioxidant ingredients such as Algae Keratin Extract that has a water binding function and boosts collagen production, a stabilized Vitamin C form which offers photo protection, and organic sulfur (MSM) that pushes out toxins of the skin and makes skin more elastic. Other great natural and organic ingredients include Japanese Green Tea Leaf Extract, vitamin E, rosehip oil, shea butter, evening primrose oil and others. The company claims that their product has super moisturizing and antioxidant properties. The proteins in the seaweed not only help your skin retain moisture, but also stimulate the production of collagen. According to them, it also provides up to 8 times natural UV protection in ways that common sunscreens cannot provide, so when it is combined with your normal sunscreen, you get full sun protection. Overall, it works great as a daily moisturizer and an effective after sun therapy which is suitable for all skin types. It is 72% organic, free of harmful chemicals and made in the USA. The OZ Naturals Sea Infused Herbal Moisturizer gets very good reviews. Users say it moisturizes their skin wonderfully and makes it super smooth, plump and firm almost instantly. It results in a brighter tone and tightens pores. It layers very well with serums and absorbs quickly. It feels silky going on and does not leave any greasy feeling. It does not make the skin break out and goes a long way, which also makes it an excellent value. People of older ages also seem to like it because of its good moisturizing effect. Nevertheless, there are few people that find it not as moisturizing as they would like it to be and say that for this reason they think that this products suits oily types of skin better. Still, I cannot really say anything about those comments- because there were some reviews of people with mature skin reporting that they actually love the hydrating effect this moisturizer offers to their skin- apart from mentioning that obviously everybody´s skin is different. 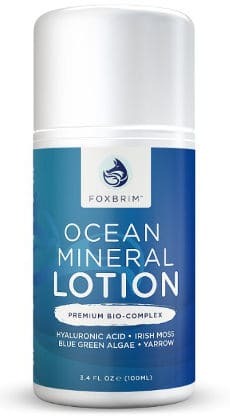 The Foxbrim Ocean Mineral Lotion & Face Moisturizer comes in a 3.4 ounce container and contains a seaweed complex, along with more than 90 minerals and micro minerals that help to boost collagen production. Some of its healthy ingredients include aloe, palm oil, safflower oil, ocean mineral complex, Irish moss and yarrow. This product does not contain harmful additives and is cruelty free. It is made in the USA and its purchase is followed by a money back guarantee. Users give it very good ratings but a lot of them have been offered the product at a discounted price for their honest review. They state that this is a lightweight to medium thick lotion that goes on smoothly and not only hydrates, but leaves skin feeling refreshed and rejuvenated. They also feel that it contains high quality ingredients and that it softens and smooths the skin while also helping it to retain its elasticity. It comes with an easy to use pump. Some people with sensitive skin have reported that it did not give them any irritation or trigger any breakouts. Few users also mentioned that they think that this product is mostly suitable for dry types of skin and not oily. While few users have said that it has a manly like scent, others have supported that it does not carry any heavy smell while I also found one reviewer saying that it is unscented. I would go more for the view that this algae face moisturizer has some kind of smell that while for some it is not heavy for few others it feels a bit strong. The Era Organics Natural Face Moisturizer is contained in a 4 ounce container, comes with a 60 day money back guarantee and is considered to be an advanced healing formula for the face and body. Blue-green algae, which helps to hold in your skin’s moisture, is contained in this cream but not at the top of the list. Apart from that, it also contains other natural and organic ingredients such as MSM, manuka honey, coconut oil, Shea Butter, Olive Oil and Vitamins A, B2, B5, C, and E.
According to the manufacturer, this is a deep hydrating product whose hydration lasts up to 8-12 hours. It is a hypo allergenic formula that instantly soothes dry skin and restores natural pH balance. The company recommends it for oily, dry as well as damaged and sensitive skin and the benefits they claim it offers is deep hydration, skin rejuvenation, softening of tough skin, reducing itchy skin, inflammation reduction, skin healing, plumping cell to reduce wrinkles as well as making the skin more supple and toned. If you think that all this is too much for a face and body cream to provide, then let´s have a short look at what users say about its effectiveness. 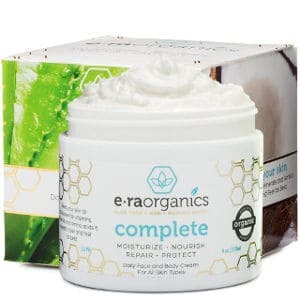 The Era Organics Complete Daily Face and Body Cream seems to have a lot of enthusiastic reviews from users who actually find a large number of benefits by using this cream, ranging from working well for acne breakouts to healing eczema and dry skin. It has even been mentioned by one user as effective with her husband´s scalp flakiness and her dog´s skinned nose! Some people prefer to use it on their body to heal even cracked dry hands, elbows and other parts rather than on their face. It melts nicely into the skin, hydrating it very well and leaving it soft. They also like the fact that it is non-greasy and they feel that a little goes a long way. While several users have stated that it doesn’t clog pores or cause breakouts, a few feel that this facial moisturizer leaves their skin feeling chalky. According to reviews, it has a light not unpleasant scent which dissipates in a few minutes. 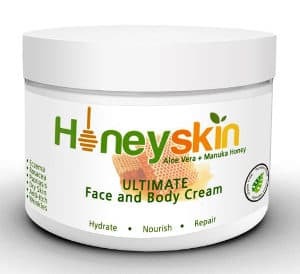 It is kind of weird but the Honeyskin Organics Face and Body Cream contains exactly the same ingredients as the previous moisturizer and in the same order. It comes in 3 sizes: 2, 4, and 8 ounces and is recommended for various skin problems such as Eczema, Rosacea, Psoriasis, itchiness and others. It is free of parabens, petroleum, or mineral oil and followed by a full money back guarantee. It gets very positive ratings and reviews with people saying that it goes on smoothly and absorbs quickly into the skin. It also leaves their skin feeling nourished, soft and fresh. Some people claim that it helps to clear acne and that it is excellent for helping heal super dry skin. 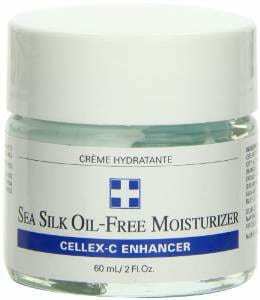 This Cellex C Enhancer Moisturizer comes in a 2 ounce container and has a number of ocean mineral ingredients including plankton, algae and seaweed extract along with few other skin boosting ingredients such as Seasilk, Sodium Hyaluronate and Jojoba Esters. Unfortunately, it also contains parabens. Overall, the people who have tried this product give it very good reviews and ratings. They like the fact that it goes on smoothly and doesn’t clog pores. Also, it doesn’t leave their skin feeling greasy or oily and actually hydrates their skin leaving it feeling more comfortable. However, few users did experience some acne breakouts when using this moisturizer. All in all, if you are looking for a cream that can help your skin remain hydrated throughout the day, then one of these algae moisturizing creams may fit the bill.